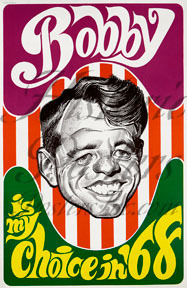 Bobby Kennedy Caricature Poster - Posters Inc.
Caricature of Senator Robert Kennedy during the 1968 presidential convention. Printed in late 60s, excellent condition. No tears, creases, etc.